how soon till Matt Hall ? Lovely tight turns out there and he's looking tidy! That's not the fastest time of the day by any stretch of the imagination but conditions are changing out on the racetrack..
Velarde working hard to get his best time in today... but a pylon has been clipped and it's a pylon down for the Spaniard! Come on Matt Hall !!!!!!!! Velarde 1:05.853 and the door is wide open for Matt Hall... he's just got to keep those racing lines clean! 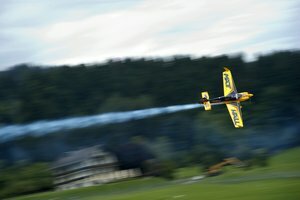 Back at the Race Airport: Peter Besenyei "We still have one heat but hopefully I will be the fastest loser. My entry speed was quite low and I could hear there was a tailwind and that lost me some time against Martin. Now I'm ready!" Le Vot now to fly against Bonhomme and our lips are sealed. Paul Bonhomme flies last and technically he could fly backwards and still have this. But it's been a session full of surprises and we've seen Arch knocked out and also Lamb. Watch this space. Back at the Race Airport, Matt Hall: "It was extremely rough, like Las Vegas last year and I just wanted to keep it in the track." Free round of Tabasco for Zool. Last man for the Round of 14... it's a 192kts through the Start Gate for Bonhomme... can he get through clean?! Didn/t catch that, why Le Vot was DNF? Guys, if you are having issues with the video - please let us know which platform you are on. Otherwise we can't figure out what the problem is. Browser type, mobile or desktop etc., country. Thanks! We are on it! He's cool and calm. Just as you'd expect. It's a 1.01.536 including 2s. He's through. Wow is it the same gate each time ? How long till you are live again? What time is the next live screening please, Final 8? What time is the round of 8? It looks like I missed the information - when the transmission will back for the Round of 8? What are the times of the round of 14? Round of 8 coming up at 1600 local time! Any chance of getting the official results table, for those of us who were unable to watch the video?